Located about 20 minutes from us, we don't often have occasion to go but we had a great day browsing at Suite Pieces, From the Source and The Thing, swinging at the playground and enjoying Polish food at Karzcma. It was a very hipster day. Which reminded me that I really have to update my One Day Guide to Brooklyn (which is decidedly South Brooklyn focused only b/c that's where I hang). While most of it still correct, it's time for a refresh of my favorite spots and add some new highlights of my fine borough. Which brings me to my main question: For those of you who are locals or have visited before, what is your favorite spot? I'd love to do a little more exploring before I put the next edition on paper. LOVE Karzcma. My mother's family lived in Greenpoint for much of the 1900s... they are all bewildered by the hipster takeover (most of them left in the 80s). 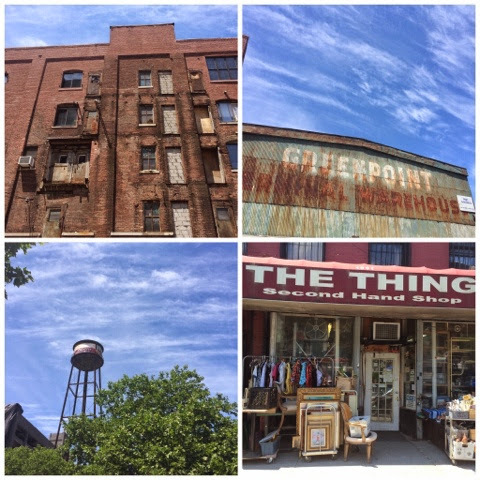 Greenpoint is a great little place to check out and changing so quickly. It's crazy how much its changed! Speedy Romeo in Clinton Hill! That menu looks delish! Thanks. Peter Pan Donut! The best doughnuts ever! Can you believe I've never been? My husband isn't a big doughnut person so we never seem to get around to it but now you are making me want a doughnut! I don't think many tourists make it to my park of Brooklyn, but Sunset Park has the best views of the city, and the best tacos are within a couple blocks of the park too! I'm actually in Sunset Park a lot (its one of those neighborhoods that don't get enough credit!) but I don't think I know a good taco place. Whats the name/location? It really doesn't! Tacos Matamoros (5th at 45th) and Taco El Bronco (44th and 4th) are the closest great ones, and I also like Tulcingo Deli VI (5th at 56th), but it is a bit of a hike from the park. Thanks! I'll definitely check both out. I haven't had a good taco in NYC since the 90s. Have you been to Tanoreen (http://www.tanoreen.com/)? It is seriously amazing. I would recommend going with a group and just ordering tons of appetizers. It is SO good. Also, it's really far, but biking from Carroll Gardens out to Riis Park used to be a favorite of mine - you get to see so much of Brooklyn! I love biking down Bedford Ave. Plus you get to go to a beautiful beach at the end! No I don't think so. Thanks so much for the recommendation - I'll definitely check it out.